Another science TV series will debut on PBS next week - The Cat in the Hat Knows a Lot About That. I can honestly say that I'm pretty excited about this new addition to children's programming because there is a bevy of related books already available for kids to read. Inspired by the Random House Dr. Seuss Learning Library book series (and of course the original Dr. Seuss book, The Cat in the Hat), this animated TV series hopefully will send a few kids to the library to explore those science books and maybe even pick up a few more along the way. According to the press release about the series, "THE CAT IN THE HAT KNOWS A LOT ABOUT THAT! was created in response to recent findings that children graduating from kindergarten are less prepared to learn about science than about other subjects. The series supports young children’s science learning by introducing scientific inquiry skills, teaching core science concepts and vocabulary, and preparing preschoolers for kindergarten and first grade science curriculum — all in whimsical style." Sounds like the perfect show for my kids. We're planning to start incorporating more science related projects into our home activities (by participating in Science Sunday at Adventures in Mommydom) so time will tell if this new show will be a good complimentary resource. While we haven't read any of The Cat in the Hat science books, my daughter does enjoy the original The Cat in the Hat book. She even decided to check out the sequel, The Cat in the Hat Comes Back from the library this week all by herself. A couple months ago she attended a day camp and on one rainy day they participated in The Cat in the Hat themed activities. Since I hadn't prepared a stART craft this week, I thought I'd post her rainy day drawing. The book does make the perfect rainy day read! 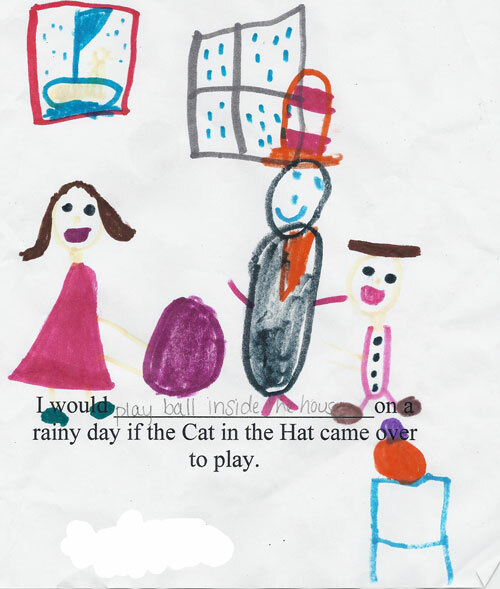 As shown by her artwork, my daughter would like to play ball if the Cat in the Hat came over to play on a rainy day. Let's hope he doesn't visit any time soon. I don't encourage ball playing inside the home, especially with a character like the Cat! A Mommy's Adventures hosts the "stART" meme (Story + Art) each week. Homeschool Creations hosts the weekly Preschool Corner link-up, a place to share activities for preschool and 5K. We like the Cat in the Hat science books, as well as the original Cat in the Hat. All great! I am excited about this show too. I totally missed when you said it was a show. I was thinking about the books in their science series, and I love those. I'd be worried too if the Cat came over to play at our house, but her drawing is very cute. The Cat in the Hat is a perennial - in any format. Your daughter's drawing is charming. What fun to discover your blog. Thanks so much for following mine! And congratulations on winning the draw for Floating on Mama's Song. I will have to check out the book series, Ive never heard of it. I don't know if we get the channel for the show though, it didn't show up when I searched. I love the Cat in the Hat and The Cat in the Hat comes back.